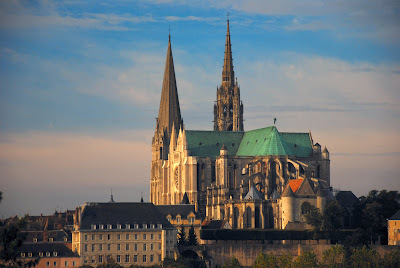 The Chartres Cathedral, located in Chartres 50 miles southwest of Paris, is a massive Roman Catholic cathedral considered one of France's best examples of Gothic architecture (along with Notre Dame in Paris). 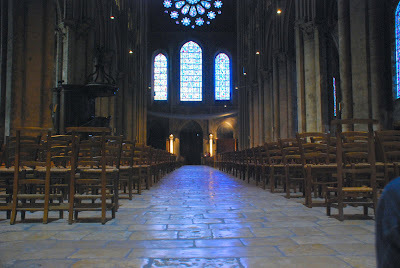 Unlike Notre Dame, however, which resides in the very heart of Paris on Ile de la Cite and is therefore not visible until you are right upon it unless seen from an elevated position, Chartres Cathedral towers above the much smaller city and can be seen for miles around across the wheat fields. 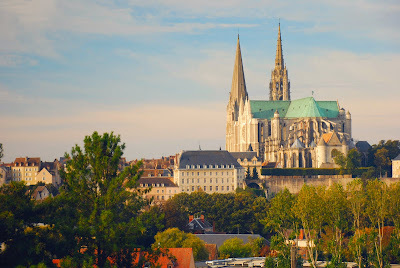 The current structure (the fourth) was built in the 12th-13th centuries (about the same time as Notre Dame) and was one of the first to include flying buttresses. 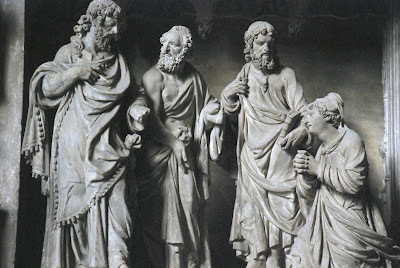 If interested you can read more detailed facts about the history and architecture at Wikipedia. 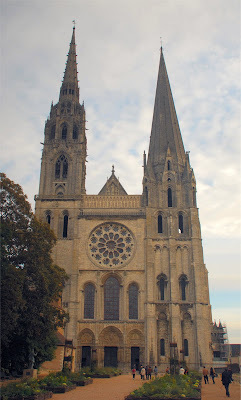 The entrance to the church faces southwest with contrasting towers. 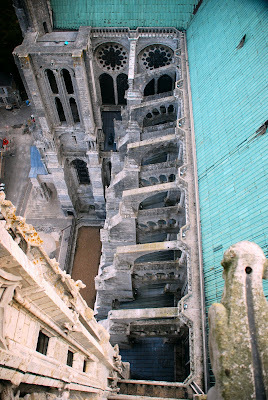 You can climb the left tower via narrow spiral stairs. Large rose stained glass window at the rear of the church. 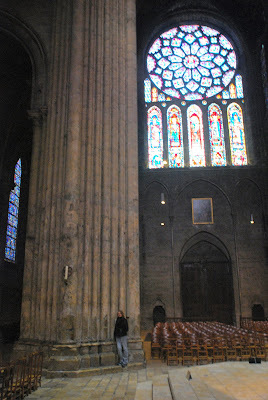 Massive columns supporting the nave (Amanda is standing next to it) with another rose window in the northwest chapel. 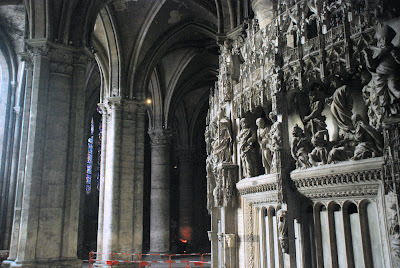 Row of jamb statues along the south transept (see more about jamb statues at Chartres here). 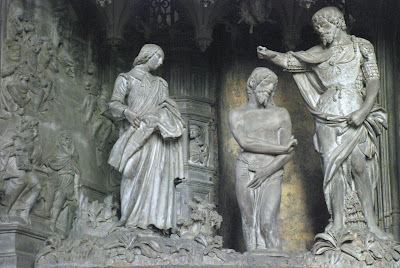 These statues are above small doorways (I think they must have been really short 800 years ago!) 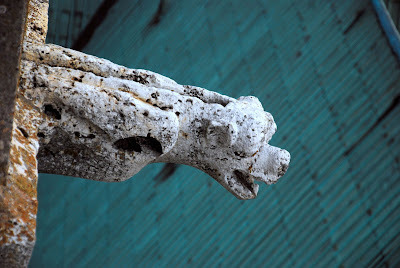 and are amazingly intricate. 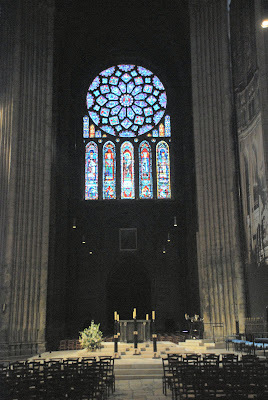 Facing the front of the cathedral from the altar. 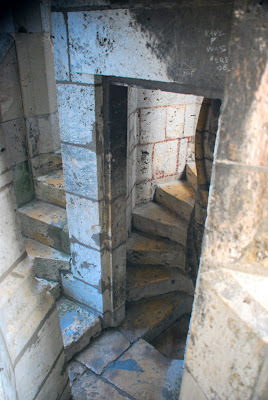 Spiral stairs in the left (west) tower. 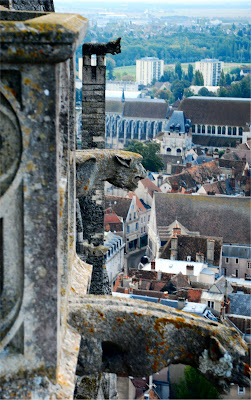 Gargoyles on the front of the two towers. The "dog" at the top center is actually on the right tower while the lower two are on the left tower. 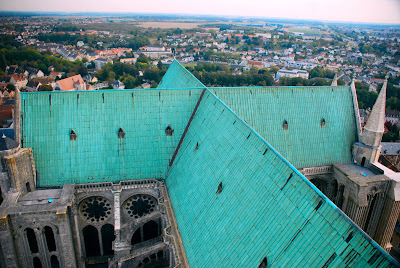 Roof from the left (west) tower looking out over the city to the east.